Pixalate, an analytics platform for programmatic advertising, which also happens to publish a "quality rating" standard known as the Seller Trust Index, announced its top 20 sellers for January. Google, OpenX and Rubicon Project hold the top three positions respectively - see the graph below to see which vendors rounded out the top 20. 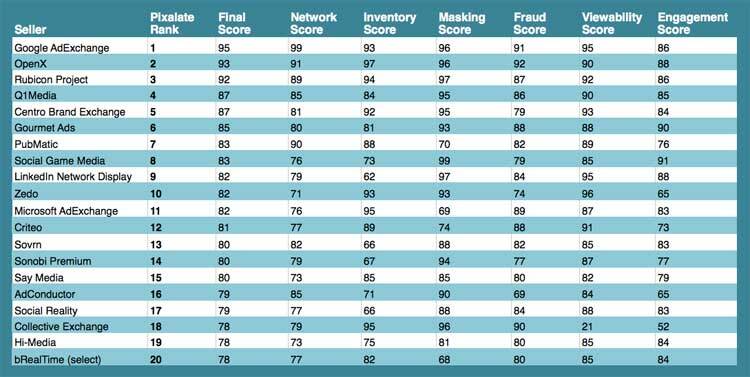 Pixalate's rankings for the Seller Trust Index are based on a proprietary analysis of event data occurring within real-time exchanges. So, what is that we can glean from a report of this nature? According to Pixalate fonder and CEO Jalal Nasir, it's that a shift from quantity based metrics to those based on quality is occurring. "Quantity-based metrics -- such as reach, for instance -- tell brands a limited story. We believe that full transparency will bring trust to our industry," said Nasir. And what do vendors like OpenX think of the rankings? "Pixalate is performing a crucial service to the industry with its ongoing focus on this significant issue. As a result, the ecosystem is improved by ensuring that advertising is driven to the supply pools with the highest quality. We're especially gratified that the investments that OpenX has made over the last three years, both in technology and people, are generating these results."